Foosball Tips - Learn to Improve Your Game & Play Like a PRO! Foosball is a unique game which has been translated from a home entertainment game into a sport. That’s why many players are looking for Foosball Tips. This sport is enjoyed by many persons who are enthusiasts and have gone on to become professional players of the game, and others have settled for just being spectators. Today you will find some of the foosball tips which can make your game better, but first, let’s look a little bit back in time. Foosball came about in 1922 when Harold Thornton was privileged to experience a match in England at the Tottenham Hotspurs Football Club, where he left the game very enthused about creating a board game similar to the game of football, which could be played at home. He creatively made the game from a box of matches, and his uncle, Louis P. Thornton who is a United States resident, patented the game in 1927, which never took off until decades later. Learning to play foosball takes some dedication as you will find based on what many experts say; the game takes years to truly master. The choice of a foosball table is important especially if you are considering playing the game eventually, on a serious level. A sturdy wooden table, which is one of the high-end ones, is an excellent investment in your foosball future. Choose a good teacher, to begin with, but if you are not able to hire a teacher, you can always go down to the foosball playing hot-spots and learn from the many skilled players there. You will be able to learn lots of skilled techniques and gain a wealth of information and good practice. Professional foosball players will also advise as a new player, you choose a particular foosball shot you like and make it your signature play. It is good to be skilled at many if not all the intricate shots; however it is not wise to learn them all at once and expect to be comfortable playing them. If you have been to a Tournament you will realize the logic behind this advice. You will see how detailed the plays for many intricate shots are honed, and you will become as good sometime in the future, but it is better to not frustrate you on first playing of the game. Because it is a mental game which is very enjoyable when played for fun, this is how you will hone your skills by practicing plays with other seasoned players in friendly games. Overwhelming your mind with wanting to be expert at the game too soon, will only get you frustrated. The first rule of thumb in learning to play foosball is not just rolling and pushing the rod with the playing men in order to move the ball into the goal! Now that we have gotten this perception out of the way, we can get down to the serious but fun business of learning the basics of playing foosball. Like playing any game, whether on a board or on the field or court, there are positions, and rules which govern the many outcomes. Adhering to these rules will set players apart from basic animals who just choose to go wild. Let’s check out other Foosball Tips. The game has rules as to a number of players which may be engaged in any session. There are teams of 1 on 1 and 2 on 2, which is determined firstly. For beginners, you need to know where the defenders and offenders side of the table is located so you position team members or member accordingly. When the decision of who will be playing defense and offense is established, then, you may begin the game. Here is one of the Foosball tips. It is important to stick as closely to as many official rules as you can, and for beginners, it is also important for them to learn the right way first, so there are no misunderstandings moving forward. A simple thing as a coin toss determines which team starts play. Remember, this also happens on the Soccer field, whether it is a friendly match or a tournament. The decision on which team plays first in foosball is decided, and after the goal is scored, the opposing team will begin the next round. Serving of the ball is also determined by either dropping the ball on the field or, serving it from the built-in serving holes on either side of the table. Out of Bounds play is very simple; it simply means, the foosball ball goes out from the basic sides of the foosball table and beyond the airspace above the edge of the table. The team who played the ball “out of bounds” must concede, and their opponents will have the official serving position; unless there are disputes, playing continues. Teams are allowed a limited time during play to have the ball. Depending on the position on the field of playing men determines the time factor. Midfield players are allowed to have the ball per team no longer than 10-seconds; while other rows are allowed to have a 15-second advantage of play. This keeps the ball in play equally for both teams. The teams at coin toss will decide which team plays whether in defense or offense positions. A double team line up will have the one team member playing defense on the back two rods, while the next player will control the front two rods as the offence. Switching of positions may be done during “Time-out” periods or when changing teams for ball serving. For single playing teams, the positions are changed after each match is over. This is one of the Foosball Tips, do you like it? A foosball ball goes dead if there is a flaw in the manufacturing of the playing field on the foosball table. This can be very challenging during plays. Another way you may experience a dead ball situation is, if the ball goes out of play in the middle of the field and is not easily reached by any team. A 5-bar dead ball allows the player a re-serve of the ball to continue play, while a dead ball in the midfield of either team allows the closest defender of either team to re-serve the ball. These two infractions are not allowed in foosball, but many new players to the game will make these mistakes. Spinning is making a 360 degree turn on the rod to try and make a goal. Seasoned players will have a field day with this one, and though it is illegal, your opponent will have the right to a free serve; on you! Jarring is also another illegal play, as this is done when you slam the rods hard against the rubbers to shift the ball out of play from your opponent, or, you slam your body intentionally against the table. These plays will cause you to lose control of the ball and this auger well for your opponent. 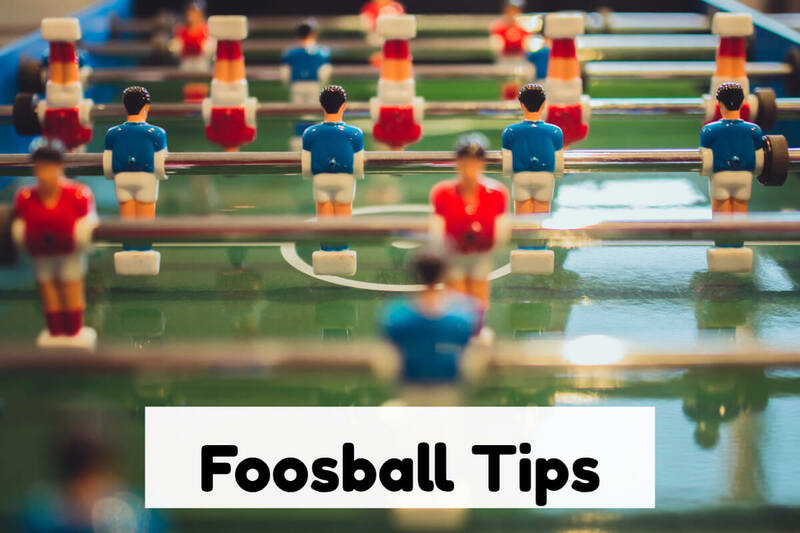 Let’s take a look at another tip from many Foosball Tips. It is illegal to reach into the game during play for the ball! You only do this with permission from your opponents. If this is done without permission, the opposing team has the right to take possession of the ball and start it into play. If the team in play did not have possession of the ball, then the opposing team automatically gets a goal. Keeping score is relatively easy. If the ball goes into goal and bounces back out, it is still counted. The scoring bar is checked and the team gets the goal. Playing time for any foosball game depends on the team lineup and what two categories of scoring goals will be used to determine a win. A best out of 3 to 5 game is counted or a 5 goal scored first by any team is also considered as a win. There are many more foosball tips and rules for the beginner to learn. It is very important after understanding these basic foosball tips of the game to remember to enjoy playing. The fun is getting there for obtaining a professional standing, so learn as much as you can, as quickly as you can, while having a much fun as you are legally allowed. Hope you liked our Foosball Tips and that you’ve learned something new today!